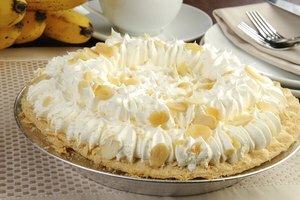 Fluffy, baked pie meringue is the topping used on many custard or curd-filled pies. 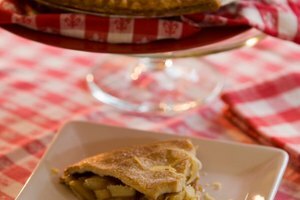 Although several factors can cause problems, the main reason that meringue pulls away from the sides of a pie crust is that the meringue simply wasn’t sealed to the pie when it was added. The time to prevent a separated meringue is when you spread the meringue layer onto the pie. Beat the meringue ingredients according to your recipe. The meringue is ready to put on the pie when the peaks stiffen and take on a glossy appearance. The gloss signifies that the sugar is sufficiently dissolved in the egg whites and is evenly distributed throughout the foamy meringue. 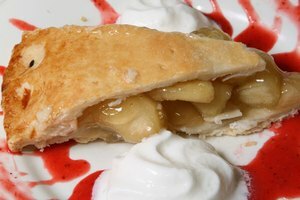 Place dollops of meringue on top of the hot pie filling, working quickly with a clean, grease-free spatula. Beginning with a wreath of dollops around the crust edge, work towards the center to cover the filling completely. Seal the meringue to the crust by pressing the meringue around the pie with the back of a clean, grease-free spoon so the edge of the meringue touches the edge of the crust. Continue pressing the meringue onto the pie to eliminate air pockets between the hot filling and the bottom of the meringue layer. The heat from the filling starts cooking the bottom of the meringue layer as soon as they make contact, which helps hold the meringue in place. Make peaks and swirls in the meringue with the back of the spoon using a light touch, being careful not to dislodge the layers. Bake the meringue on the hot pie for the time called for in the recipe, typically at least 15 minutes. Cool the pie completely at room temperature on a wire rack. Fully bake the meringue to make certain that the center of the layer is done. You can check the center of the meringue with an instant read thermometer -- the suggested temperature is 160 degrees Fahrenheit. Serve meringue pies the same day they are baked. 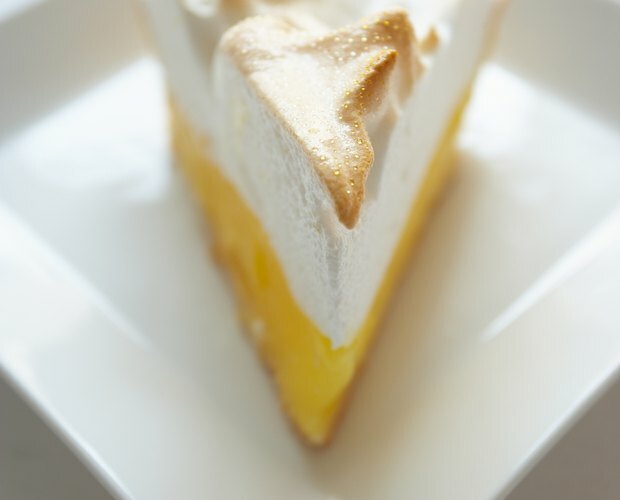 Leftovers separate after refrigeration; moisture condenses and breaks down the structure of the meringue. Always use clean, grease-free utensils when making meringue. Meringue consists of foamy egg white bubbles; even minute particles of fat interfere with the bubbles’ surface tension and cohesion, causing the meringue to break down.